All the research that went into writing Divorce Your Car! still comes in handy for others, and that’s nice to see. One example comes from Diane MacEachern, who recently posted a piece called “Can You Recycle Your Car?” at her “Big Green Purse” blog. 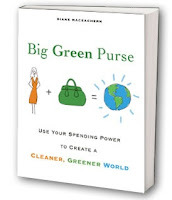 Diane's book and website of the same name both advocate using the power of the purse to make green choices. 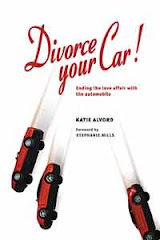 Both her blog post and her book cite Divorce Your Car! in noting that one-third of the considerable pollution and waste generated by cars comes from manufacturing them. Disposal of cars creates additional waste, despite the fact that automotive recycling is big business. Diane reports that manufacturers have lately nudged up the quantity of recycled materials in new cars; for instance, she writes, ten percent of a new Mini Cooper’s plastic comes from recycled stock. She advocates continuing the move toward more recycling with personal actions such as recycling motor oil, donating old cars to non-profits, and buying recycled products – an important step to ensure that recycling works, as we also reduce our driving, reduce our overall use of stuff, and reuse what we already have. The post is both informative and a timely reminder that not all automotive pollution comes out of the tailpipe. Thanks, Diane!